The Independent Games Festival (IGF), an annual festival at the Game Developers Conference is the largest annual gathering of the indie video game industry. It was founded in 1998 to assist and inspire innovation in video game development and to recognize the best independent video game developers. 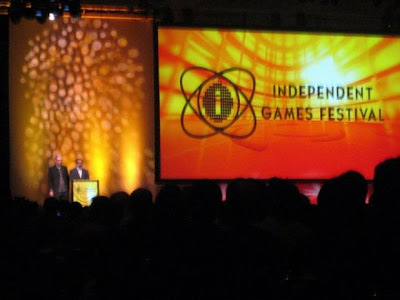 Linux games Minecraft, Amnesia: The Dark Descent, Cobalt and Tiny and Big were finalist in last IGF with Minecraft being the grand prize winner. Amnesia and Minecraft together won 5 out of total 10 awards. Next Independent Games Festival will be held in March 2012 at San Francisco's Game Developers Conference. As many as 570 games have been submitted and many of them are our favorite Linux games. This year cash prizes of more than $ 50,000 will be awarded to winners with grand prize of $30,000 to one game. Lets have a look at Linux games participating in IGF 2012. King Arthur's Gold is a game about mining, building castles and destroying your enemies. It is a side-scrolling 2D action multiplayer war game with focus on building, constructing siege machines and intense PvP combat. The game features 3 classes: Knight, Archer or Builder, 64+ people real-time multiplayer, mining resources, siege machines and fully collapsible 2D physics. In Atom Zombie Smasher you take tactical command of mercenary forces fighting against the zombie apocalypse. You need to evacuate everyone before they fall prey to the undead. You will be able to conduct massive rescue operations with a helping hand from snipers, artillery crews, orbital bombardments and will experience the tactical richness of fully-destructible environments and procedurally-generated campaigns. In Blocks That Matter you play a role of Tetrobot: a tiny robot that can drill blocks of matter one by one, collect them, and recycle them into new pieces of 4 blocks. You also have the possibility to destroy lines of 8+ blocks. Sand, wood, stone, obsidian, iron, diamond: each matter has its specific behaviour you'll have to use wisely and take advantage of them. Blocks That Matter already won $40,000 as grand prize of Dream.Build.Play game competition this year. Chaos Stream is a fast-paced, vertically scrolling shoot em up, in which the graphics are represented by character-space restricted ASCII. Chasing Aurora is an intuitive aerial action game where you glide over the stormy peaks and the sleepy meadows of the Alps. You will encounter hostile wildlife and the mysterious tribes of the Bird People. Your task is simple: return Aurora, the dawn, to the skies. Colourbind is a physics/puzzle/platform game that involves doing strange things with coloured gravity. The basic idea is that with regular gravity, things fall down. In Colourbind, however, things can fall in different directions - instead of gravity just being down, there are three different gravities, each of a different colour. So red gravity might be down, but blue gravity could be up and green gravity, over to the right. That means that red objects fall down, as normal, but blue objects fall up to the ceiling, and green objects fall to the right. You control a little two-wheeled car thingy, and the goal is to get to the spinning coloured triangle. More info about other Linux games in next part which I will publish tomorrow. Getting them all in one post with so many embedded videos probably won't be a good idea as it could slow down entire page. Stay tuned! !